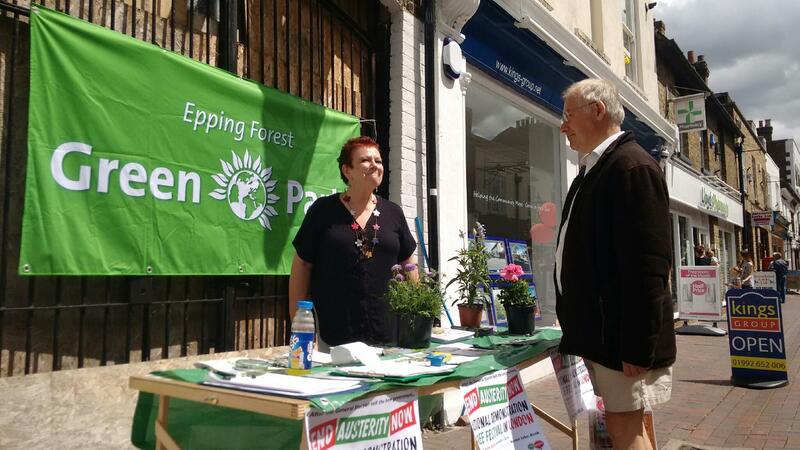 Linda from Waltham Abbey Greens chatting to a local resident on our Street Surgery stall on Saturday. Now that all of that election malarkey is a month behind us we can get on with trying to make a difference in Waltham Abbey. Things are going to be difficult – the Coalition government imposed massive cuts on local authority funding and the Conservative government is very unlikely to be any better. On top of that we’ve a district council which is committed to an ongoing council tax freeze, regardless of its impact on local services. Waltham Abbey Town Council is also somewhat hamstrung by having very limited authority. A lot of decisions are made by our District or County councils, irrespective of the wishes of Waltham Abbey’s residents. I think it worth mentioning that there were no public questions to last Thursday’s Town Council meetings and there was only one member of the public in attendance (me!) One of the first steps in getting issues addressed is to find out what’s already being done about them. The chances are that the council, either Town or District, is already on the case. Again, there might not be much the Town Council can do but they can report back on the current position if asked. Litter and untidy streets: particularly chewing gum on Sun Street. I’m baffled that anybody thinks it’s acceptable to discard chewing gum on the footpath and it is an absolute pain to get off. Parking: a lack of parking space does lead to a lot of pavement parking. It’s a pain, it’s illegal, but I do have some sympathy with those who do it. Our public transport is somewhat lacking; many people don’t have much choice other than to use their cars. Refuse collection: it’s safe to say that the transfer to Biffa and the change in collections has been a bit of a shambles. Interesting fact: HMRC took Biffa to a tribunal in November 2014 over tax avoidance. Smell of the drains: this was particularly noticeable on Saturday! To an extent we can’t blame the bus companies for any of this: they are private businesses which are there to make a profit. Ultimately the blame lies with deregulation and privatisation, neither of which are within Waltham Abbey Town Council’s purview, or Epping Forest District Council’s. Essex County Council would probably find itself in trouble with the Department of Communities and Local Government (DCLG) if it tried bringing buses back in-house. Still, there’s no harm in asking! At the very least the council could provide bigger subsidies to private bus companies to keep unprofitable services running. That’s not ideal but bus services are important, whether they’re profitable or not. I’m going to submit questions to Waltham Abbey Town Council about a few of these issues. The next full Council meeting isn’t until 29th July but there are Policy and Resources Committee meetings before that. If you’ve any comments please feel free to add them below (no swearing though – I’m OK with it but others reading this might not be) or send me an email: walthamabbey@eppingforest.greenparty.org.uk. You can also come along to our next Waltham Abbey Green Drinks night – date and venue TBC.